Newk (Bums), 14 games, starting April 17. Cubs’ Jim Davis, 7 games. Redlegs, 14 games, starting June 28. A’s, 12 games, starting April 24. April 20 - Buhl 1 hits (3 walks) Cubs, 3-4-0/0-1-0. April 21 - Braves beat Cards, 24-27-1/6-14-2. Johnny Logan 6-6, 7 RBI, hits for cycle. Adcock 2-4, 7 RBI, 2 homers. April 22 - Bums (Newcombe) beats Pirates, 24-28-1/1-4-1. Campy 5-6, 4 runs, double. Snider 4-7, 4 runs, 5 RBI, 2 HR. Redlegs’ Brooks Lawrence 1 hits (walks 7)Cubs in second game of doubleheader. April 25 - Herb Score no-hits A’s, 4-0. Gives up 3 walks. April 27 - Bums beat Pirates in 16 on pinch-hit single by Newcombe in bottom of 16th, 8-16-2/7-18-2. Clemente 5-8. Bums use 26 players. Pirates use 24. May 1- Cards beat Pirates, 22-23-1/7-11-2. Boyer 5-6, 4 runs, 4 RBI, double, homer. May 6 - Cubs come back to beat Pirates in 14, 3-12-0/2-7-2, on 2 run homer in bottom of 9th by Miksis. Each team uses 20 players. Sam Jones goes first 9, K’s 16. May 8 - Chisox score 10 in top of 7th and hold on to beat Boston 11-13-2/10-13-1. May 12 - Bums beat Giants in 15, 5-9-0/4-11-0 on Amoros single in bottom of 15th. May 13 - Bums beat Giants in 12, 6-11-0/5-8-4 on PH single by Zimmer in bottom of 12th. Newcombe goes the distance and is now 7-0/2.25. A’s Tommy LaSorda shuts-out Tribe (Score), 1-3-1/0-4-1 in his 1st start. Cubs beat Cards in nightcap of doubleheader, 6-18-2/5-13-2, scoring winning run in bottom of 16th. Cards moved ahead 4-3 in 15th but Cubs tied it. Cards then scored again in 16th but Cubs then scored 2. May 16 - Tigers score 12 in bottom of 8th against Red Sox, winning 18-19-5/8-8-4. Every Tiger starter except Lary (pitcher) had at least 1 hit. May 19 - Newcombe pitches 2 hitter against 2nd place Redlegs. winning 3-7-0/1-2-0. Newk is now 8-0, 2.09. May 20 - Ed Bailey hits 3 homers in 1st game of doubleheader against Phils. Bailey 3-5 with 6 RBI. May 21 - Cards beat Giants, 15-19-0/3-8-2. May 29 - Newk wins 10th (10-0, 2.12), beating Pittsburgh 3-1. Bums now 27-6, 2 up over Redlegs (26-9). June 3 - Mantle hits grand slam in bottom of 10th in game 1 against Detroit to give Yanks a 5-1 win. Newk wins his 11th straight (11-0, 2.20), 14-3 over Cubs. June 5- Dodgers’ Don Demeter gets his only hit all year, a PH homer off Spahn, to enable Bums to tie Braves at 3 in 7th. Brooklyn then scores 3 in 8th and 4 in 9th to win 10-3. Every Bum except pitcher Craig had at least 1 hit. June 6 - Newk wins 12th straight (12-0/2.27), 4-8-0/3-3-1 over Braves. June 10 - Yanks come back to beat Cleveland in bottom of 10th after going behind 5-1. Narleski (21) starts the inning but is immediately injured and replaced by Houtteman (1). First 3 batters get on base before Mantle hits GS to tie at 6. After Collins strikes out, Skowron walks and then, an out later, Martin doubles him home to win it. June 11 - Newk wins 13th straight (13-0/2.41), beating Cards, 5-7-0/4-7-0. June 13 - Mantle hits another GS in bottom of 9th, this time to tie game. Yanks then go on to win in 10 over Chisox, 8-12-1/7-10-0. Mantle 4-5, 3 runs. Now batting .361 with 22 homers, 54 RBI (both tops in AL), (Kuenn .396). June 17 - Newk wins 14th straight (14-0, 2.23), beating Braves in 4-6-1/1-3-0 in comeback victory climaxed by Randy Jackson 2 run homer in bottom of 7th. George Wilson hits 2 run homer (his 1st) in bottom of 9th to give Giants a 5-4 come-back win over Redlegs in opener of twin-bill. June 21 - Newk finally loses his 1st, to Cards (Wehmeier), 4-11-0/2-6-0. Newk goes the distance and is now 14-1/2.35. A’s beat Nats, 18-21-1/5-11-2. Every A’s starter had at least 1 hit. Power 4-4, 3 runs. June 23 - Ford and McDermott pitch shutouts against Chisox in doubleheader, 3-8-0/0-2-1 (Ford) and 5-7-0/0-5-0 (McDermott) in nightcap. Yanks now 10 ½ up over Tigers, Boston and Tribe. June 24 - Giants drop 2 to Braves (5-4 in 10 and then 13-3) and fall into last place. June 25 - Art Fowler wins 10th (10-2/2.45), pitching 11 inning shutout over Pirates, 5-9-2/0-5-1. Kline goes distance in losing. June 26 - Boston beats Chicago, 17-20-0-/4-6-0. Jensen 5 RBI. July 3 - Yanks’ Rip Coleman 2 hits O’s, 1-7-1/0-2-1, and goes 4-0/1.96. July 4- Newk wins 15th (15-1/2.33) over Giants in 1st game of doubleheader, 6-2 (4 hitter CG). July 5 - In last start before All Star break, Ford shuts-out Boston, 9-10-1/0-1-1. The only Boston hit is a single by Gernert. Ford now 13-2/1.18. July 8 - Newk wins 16th (16-1/2.38), beating Phils in 1st game of twin-bill, 15-22-1/3-6-1. July 13 - Newk wins 17th (17-1/2.24), beating Braves in 1st game of doubleheader, 8-2. Hodges 4-5. Bums win 9th in a row in night-cap, 2-1, on Snider homer in top of 13th. July 15 - Ford shuts-out Chicago 25-8-0/0-2-2 in 1st game of double-header, winning his 14th (14-2/1.11). Mantle hits his 32nd. Newk wins 18th (18-1/2.22), beating Chicago in opener of twin-bill, 6-10-0/2-9-0. Boston beats Cleve in opener of doubleheader, 16-17-0/1-4-2. Pittsburgh wins 2nd game of twin-bill over Milwaukee in 16 innings, 7-15-2/6-13-1. July 16 - Cards beat Phils, 17-20-2/3-6-3. Every Card starter had at least 1 hit. Blasingame 4-6. July 20 - Newk wins 19th ( 2.11) over Cards 3-6-0/0-2-1. July 21 - White Sox beat Nats, 16-20-0/4-10-0. July 23 - Redlegs tie Bums for 1st, as they beat Pirates 7-5. All 5 Pirate runs driven in by Frank Thomas. Bums now 62-25, Redlegs 63-26. July 24 - Dodgers come back from 6-0 deficit in bottom of 2nd to beat Redlegs on Snider homer in bottom of 13th, 10-14-0/9-17-2. Ed Bailey 6-6 with 2 homers and 3 RBI; Skoonj 3-6, 4 RBI, 2 doubles. Bums move 1 game up over Cincy. July 25 - Bums come back again, this time on Hodges’ 2 run homer in bottom of 10th, to beat Redlegs, 8-11-0/6-7-0. Amoros 3-3, 2 homers, 4 RBI. Bums now 2 up. Newk gives up 6 runs in 9 IP and fails to win his 20th. Braves lead Giants 3-2 in bottom of 11th with 2 outs before NY’s Hank Thompson singles and Bill Sarni homers for the win. Phils beat Cards, 3-5-2/2-14-0, scoring winning run in bottom of 15th after Cards had gone ahead in top of 15th. Murry Dickson goes the route (14.2 IP), losing. July 29 - Newk wins 20th (20-1/2.19), beating Cubs in 1st game of double-header, 12-8-0/0-6-0. Tigers beat Nats, 17-19-2/6-13-2. Every starter except Hoeft and Red Wilson had at least 2 hits. Kuenn now at .386. July 30 - Ford wins 16th (16-3/1.15), shutting out Cleveland, 8-12-2/0-9-2. Bums come back from 6-0 deficit in 5th to beat Braves,8-9-2/7-14-0 on Campy homer in bottom of 10th. Mathews 2 homers, 5 RBI. Cards beat Pirates in 15, 12-14-2/11-25-3. Cards use 24 players (8 pitchers), Pirates use 21 (7 pitchers). Clemente 6-8, 5 RBI, double, homer. Virdon 4-6, Maz 4-8. August 1 - Newk wins 21st (21-1/2.29), beating Braves 8-5. August 3 - Ford (17-3/1.09) beats Tigers, 10-14-3/1-4-2.Skowron 3-5, 2 homers, 5 RBI. A’s beat Nats in 17 innings, 7-12-2/6-14-1. August 9 - Tigers (Trucks) beat A’s, 15-13-0/0-6-0. August 10 - Ford pitches 9th shutout (18-3/1.04) over Baltimore, 4-10-0/0-4-0. August 12 - Yanks beat O’s in 1st game of doubleheader on double by Mantle (1-7) in bottom of 15th, 3-9-3/2-8-3. August 13 - Boston greets Nats’ reliever Pascual with 3 homers in a row (Lepcio, Williams, Gernert) in top of 4th. Boston goes on to win, 22-28-3/14-16-4. Goodman 5 RBI, Lepcio 2 homers. August 15 - Newk (22-3/2.53) beats Giants, 5-4-1/0-1-0. August 19 - Newk wins 23rd (23-3/2.50), beating Phils, 8-15-0/2-6-0. Campy 4-5, 3 runs, double and homer. August 20 - Boston beats Nats in 1st game of twin-bill, 18-18-0/2-10-1. Pitcher Tom Brewer 2-5, 5 RBI. August 21 - Cubs’ Sam Jones no-hits Phils (Roberts), 2-6-1/0-0-2. Gives up 3 walks. August 24 - A’s beat Nats, 15-18-2/5-13-1. Harry Simpson 2-6, 6RBI, 2 homers, Hec Lopez 4 RBI, homer, 3-6, Hal Smith 5-6, triple, 2 RBI. Every player except pitchers had at least a hit. Ramos lost (2-11/9.22). August 26 - Tribe’s Wynn wins 20th (20-7/1.57), beating Nats, 2-61-/0-4-0. August 27 - Newk beats Braves, 7-13-0/3-5-2, winning 24th (24-4/2.51). August 31 - Newk wins 25th (25-4/2.56), over Giants, 9-11-0/4-5-2. September 1 - Tribe beats Chisox in 17 innings, 6-10-1/2-11-0. Starters Lemon and Staley each pitch the 1st 12. Braves (Spahn, 14-10/2.87) beat Cards in 13 innings, 2-5-1/1-7-1. September 2 - Ditmar drops his 20th (4-20/5.39), losing to Tigers, 8-13-1/1-2-0. Tigers’ Jim Small now hitting .420 (37-88). September 4 - Ford no-hits Bosox, 3-7-0/0-0-1 (6 walks) to win his 20th (20-5/1.28). It is Ford’s 10th shutout. September 8 - Redlegs beats Cards, 19-16-2/10-21-1. Bell 3-4, 5 RBI, 4 runs. 3 doubles. Burgess 3-6, 3 runs, 4 RBI, homer. Every Red starter except pitcher had at least 1 hit. September 11 - Mantle goes 5-6 against A’s in NY 9-4 win .327. Jackie hits grand slam in bottom of 9th to beat Braves 7-3. September 13 - Mantle goes 4-6, 6 RBI, 48th homer, as NY beats Detroit, 16-16-0/4-9-0. 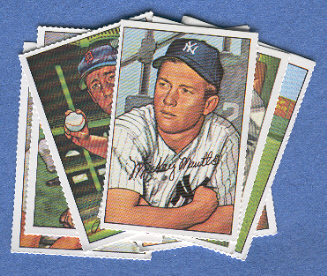 Mantle now at .332/48/113. September 15 - Newk wins 26th (26-5/2.65), beating Cubs, 5-7-1/3-7-0. A’s Carl Duser pitches 10 hit shutout against Nats in his 1st ML appearance. Braves beat Phils, 17-23-0/2-8-3. September 18 - Ford wins 23rd (23-5/1.23), beating Chisox, 15-14-0/0-4-4. Mantle 4-4, double, 49th homer; Berra homer, 4 RBI. Foytack wins 20th (20-7/4.04), bating O’s, 7-9-0/0-4-3. Kuenn 2-5, now .384. September 19 - Newk wins 27th (27-5/2.70), bating St. Louis, 5-11-0/4-6-1 with 3 in bottom of 8th. September 21 - Wynn wins 25th (25-7/1.48), beating Tigers, 6-3. 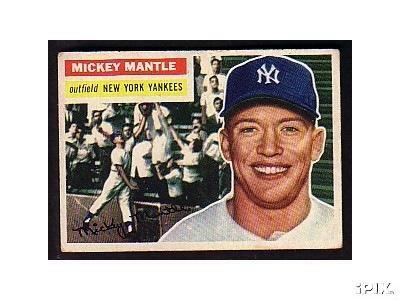 September 22 - Mantle hits 50th against Red Sox as NY wins, 18-18-4/6-10-0. Score pitches no-hitter till 11th inning against Tigers, then loses, 2-2-3/1-7-0. Gives up 10 walks; K’s 13. Score now has 301 K’s. Foytack wins 21st. Both go distance. Chisox beat A’s, 16-20-1/4-10-1. September 23 - Red Sox beat Yanks, 14-19-0/0-4-2, scoring 10 in top of 1st. September 25 - Wynn wins 26th (26-7/1.53), beating A’s, 7-3. September 26 - Mantle hits 51st, 3 run homer in top of 9th, with Yanks behind O’s 3-2, to put NY ahead 5-3. Yanks go on to win in 6-5 in 12. Yanks’ Magic Number now 2. Hodges hits 2 run homer in bottom of 10th against Robin Roberts to give Newk his 28th win (28-6/2.66). Bums’ Magin Number is 6. September 30 - Burdette wins 20th (20-10/2.56) in final start of season, beating St. Louis, 5-5-0/0-6-2.